Ex-Shropshire skipper Richard Oliver is to return to play Minor Counties cricket this summer after turning down an offer to stay with Worcestershire. The 26-year-old opening batsman left New Road at the end of last season after rejecting a new deal. Instead of a commitment to winter training in Worcester, he opted to play grade cricket in Australia for his adopted club side Geelong. 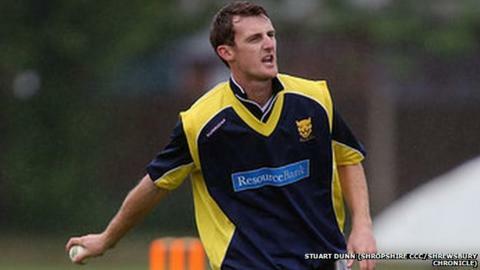 But he is back in England and will play for Shropshire in the Unicorns Trophy. The first of their four group games is on Sunday, 24 April against neighbours Herefordshire at London Road, Shrewsbury. Oliver, who made two first-class centuries for Worcestershire in 2014 after making an exciting breakthrough in T20 cricket while still with Shropshire, has received interest over the winter from other first-class counties. "It's the right place at the right time for me," said Oliver, who will play under Steve Leach, younger brother of Worcestershire vice-captain Joe Leach. "It's going to be great to go back and play for Steve Leach. He was very loyal to me when I was captain, so I can hopefully be in a position to repay some of the loyalty he gave me and make sure we progress through the group stages. "I presume that availability's going to be good for the one-dayers. If we can emulate some of the success I've had with Shropshire in the past, that will be fantastic." Shropshire have also signed fast bowler Alex Wyatt for the 2016 season, following his release by Leicestershire last summer. They also brought in former Yorkshire and Derbyshire left-arm spinner David Wainwright in December.